Planning a hen party is no easy job – besides finding a suitable location, activity, accommodation, transport options, organising a gift for the hen, collecting deposits (and then the remaining balance) as well as ensuring all the girlies know where to be and when, there’s entertaining and kitting out the hens to think of. For those that have a night on the tiles planned, the idea of the hen party survival kit is a cute idea to prepare hens for all eventualities – and the morning after. 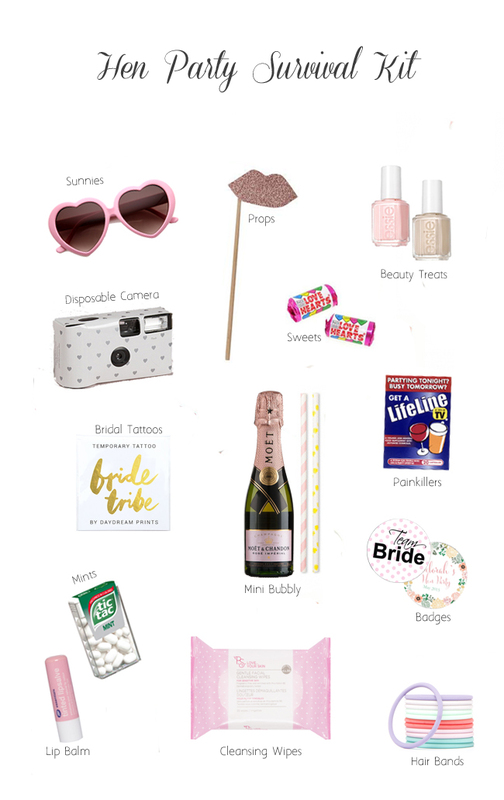 It goes without saying you don’t need all this stuff for your hen party bags – after all when you’ve a gaggle of girls to kit (in some cases 20 plus) it can be an expensive task. But we’ve rounded up some fun suggestions to help maids who are on the hunt for some inspiring bits and bobs to put in their survival kits or party packs. A few sweeties and something fun for the hen whether it be a glass of champers, cocktail or a hen badge is all that is ever expected but for those looking to deck their hens out with the works or put together a little pamper pack or survival kit for the-bride-to-be, here are some great party bag fillers! Bags – Depending on the number of girls, you’ll want to think cheap and cheerful for your party bags to pop your survival kit goodies in to. There are some gorgeous budget friendly stripy or spotty bags available to buy online (pick up some cute ones over on HenWorld.ie) and Etsy also stock mini canvas totes with the likes of ‘Bride Tribe‘, ‘Team Bride‘ and ‘Hangover Kit‘ and ‘I Regret Nothing‘ on it that would be equally awesome. Pretty things – If you’re looking for something nice and pretty to put in to the girls bags, think hair and beauty! Lippies, nail polish, nail files, tissues, mini moisturisers, clips and any other girly items will always be welcome tokens for the ladies. And practical stuff like makeup wipes, bobbins and lip balm from Penneys will be handy for the morning after. Practical things – Chances are there might be hangovers. And they may not be pretty. Some thoughtful maids opt to put painkillers in the kits to ease that fuzzy feeling the morning after or Lifelines to help counteract the effects before you even sip a glass of bubbly (make sure everyone knows what tablets they are in case of allergies etc). Another cute idea is to add a pair of sunnies in to the bags (Penneys and Tiger are best for cheap and cheerful options) to hide the tired eyes the morning after. Food stuff – Hen parties generally come with a substantial hangover. So make sure your hens are prepared for the inevitable by plying their bags with things like crisps and water (or a fizz/Lucozade) to hydrate the morning after. Another cute option is to include a coffee cup and sachet which will be welcomed by all the drivers. Sweeties (love hearts are the perfect choice), chocolate and mints will also go down well. 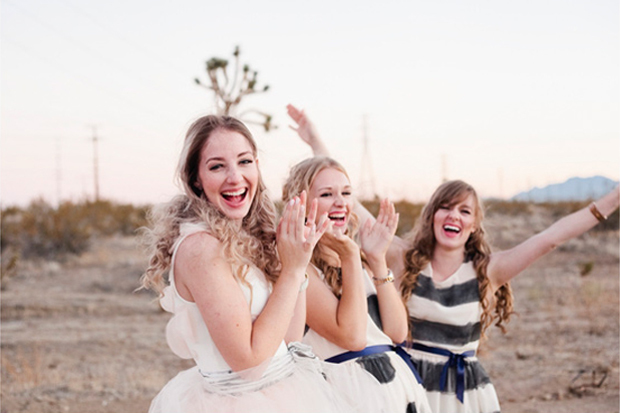 Photo Fun – It goes without saying that you’ll want memories from your hen. One way to do this is by having a couple of disposable cameras at the ready – they can be way too pricey to get one for each gal (Boots stock them from €10 and Confetti stock the adorable heart version featured above for £4.99), but you can divvy out items in the bags (not everyone has to have the same stuff) or even just have one for the bride-to-be to capture all her memories. Props are also fun to have on hand for some silly snaps – HenWorld.ie and Pearls & Lace Bridal Boutique stock some fab girly photo booth props that would be ideas for hens! Celebratory – This means one thing – champers. You can opt to have a couple of big bottles to share or if you’ve a smaller crowd, dress mini Proseccos’ with streamers, ribbons, rosettes or bows and don’t forget to add in a cutesy straw so you can sip in style (we love this floral version but polka dots and stripes are super cute too – check out Tiger for cheap deals). Dress Up – You may or may not want to give your girls something to wear to tie in with the theme. We’ve seen everything from floral crowns, bunny ears and feather boas to sunnies and simple but chic badges like above (which are available from Irish company Amore Wedding Stationery by Donna Gormley Design). Glow sticks are another hen staple and are sure to get everyone in the party mood – pick them up the likes of Dealz. Or if you want an awesome way to tag the ladies, invest in some temporary tattoos – HenWorld.ie stock these glam gold ones above and have various types including one that says ‘If lost please buy me a drink’. Genius! Finishing Touches – Add a sprinkling of confetti to the bottom of each ladies bag for a fun finishing touch! You can also order hen party stickers to seal your goodie bags – we love this bag and sticker combo over on The Dotty Hen. Tip! 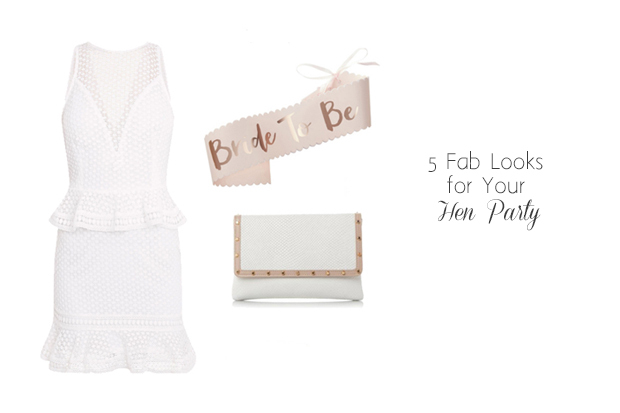 Some great places to shop for your hen goodies are HenWorld.ie, Pearls & Lace Bridal Boutique, Tiger, The Euro Store, Penneys, Dunnes Stores, Homebase and Etsy. These ideas are so cute! I hadn’t even really thought about doing a hen party goodie bag but these survival kits are just too perfect!